High Desert State Prison is located in Indian Springs Nevada. It is currently the largest correctional facility in the Nevada Department of Corrections. It is one of the most technologically advanced prisons in the country and is the reception center for all inmates in Southern Nevada. 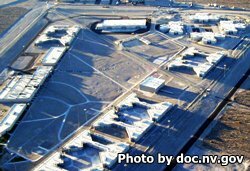 The current capacity of this prison is 4,176 inmates, and is still expanding as High Desert State Prison becomes the first facility in a complex of several that will make up the Southern Nevada Prison Complex. High Desert State Prison is considered a medium to maximum custody prison. It is secured by a lethal electric fence and seven armed guard towers, an armed perimeter patrol and a variety of electronic detection systems. Inmates are housed in 12 housing units, which are divided into smaller pods. Offenders incarcerated here can earn their GED while incarcerated and even take college courses. Vocational training in HVAC, carpentry, and automotive repair is available to inmates. Visitors must have an approved visitors application on file before they can visit. The day and time you may visit your inmate will depend on the inmate's unit. Units 1,2,3 C/D, and 4 A/B have visiting on Tuesdays from 8:30am-2:45pm. Units 3 A/B, 4 C/D, 7, 8 have visiting on Thursdays from 8:30am-2:45pm. Unit 6 has visitation on Wednesdays from 8:30am-2:45pm. Unit 9 has visitation on Fridays from 11:45am-2:45pm, and on Saturdays from 8:30am-11:30am. Unit 10 has visits on Mondays from 11:45am-2:45pm, and on Sundays from 8:30am-11:30am. Unit 11 has visiting on Fridays from 8:30am-11:30am, and on Saturdays from 11:45am-2:45pm. Unit 12 has visitation on Mondays from 8:30am-11:30am, and on Sundays from 11:45am-2:45pm. Attorney visits should be arranged through the Wardens office. Inmates in the infirmary have non-contact behind glass visitation on Mondays, Thursdays, and Fridays if medically able. Disciplinary Segregation inmates have a single monthly non-contact visits with immediate family members only.